For many people, Easter is the most significant holiday that takes place during April. But if you’re part of the ferret lovers crowd, you can live it up with 30 glorious days of celebration in honor of a little something known as Adopt A Ferret Month. What does that mean if you’re a cat lover? Well, maybe your kitty would love a ferret sibling to keep them company. As the videos below show, sometimes cats can make some unusual friends! Of course, you should make sure your cat is cool with small animals and have them meet before you bring another pet home. Make sure they get along! Here, for your viewing pleasure, are five excellent videos of cats and ferrets getting along just wonderfully in honor of Adopt A Ferret Month. Back in 2017, a kitten was rescued by a person who was already housing a busyness of ferrets–and yes, “busyness” is the term for a group of ferrets. The adorable video captured above shows what happens when the kitten meets one of the ferrets for the first time. Count Fuzzington is a very fancily-named feline. He also happens to cohabit with a couple of ferrets who have been named after the Norse mythology characters Thor and Loki. When they get together, lots of ferret and feline snuggles ensue! What we have here is some of the most fantastic ferret footage to ever hit the Internet! After meeting and playing around together for a minute or so, this ferret becomes totally smitten by his new ginger cat pal to the point where he literally attempts to cling to the cat. This is pretty much ferret-themed reality TV. This room full of toys livens up quickly with the entrance of two ferrets and four kittens. As you’d expect, much bombing around and enthusiastic playing takes place. Last but not least, please enjoy this video footage of a cat being woken up from a nap by his ferret friend. It’s fair to say that the look on the feline’s face at the end of things is one of tolerance, not gratitude. If all these videos have you considering a new furry family member, check out The American Ferret Association’s list of ferret shelters! 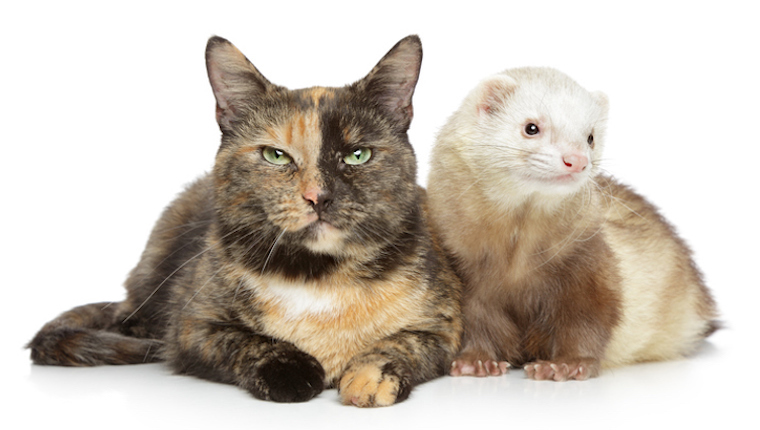 Have you ever seen cats and ferrets getting along together? Would you consider bringing a ferret home during Adopt A Ferret Month? Let us know all about it in the comments section below!